I think this is just such a great premise! I love this book so much. It's far better than the sequel imo. I like the YA cover but actually I prefer the UK one. It's a bit grittier I think. Lenore: It was pretty impressive. H: I liked the other covers better initially, but then I had to order this one, and theres really neat trasparent bits that you can only see handling it. I really enjoyed this book too! Have you read the other books in the series yet? Yeah, Ive read the Yelena series and the first two Opal books! They're great! I really enjoyed the first and second installment of this series. Glad you liked it! the covers for this series are so eye-catching along with interesting storyline. will have to give them a try. I'm strange I guess, b/c i just don't see the appeal of the series. It just didn't grab me, but glad you liked it! Sounds good. I liked her Storm glass series. Thanks! Aw, no update? I miss your blog. Love the story line. Have to put in on my spring book list. Thanks. I've been wanting to read this one. Sounds great and I also love the cover. Fabulous, catchy, Impressing.. Am searching for words. the book is really damn enjoying. and good writing too. 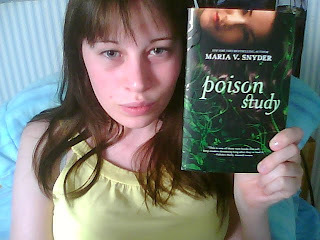 God I loved this book; it started me on my Maria Snyder worship. It's got perfect structure and an addictive, well, everything. The novel was a complete story yet also did a fabulous job setting up for the rest of the series. I finished this book on Friday, and I took all weekend to decide what I wanted to say in my review.